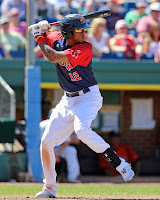 Originally projected as a third baseman due to his strong throwing arm, Almanzar's defense at the position has not developed, and he has spent increasing time at first base and designated hitter in the last three years. With 48 extra-base hits in each of the last two seasons, his power has become his most valuable asset. Roof was originally drafted by the Red Sox in the 39th round of the 2007 draft out of St. Mary's High School in Paducah, KY, but instead attended Michigan State University. After earning recognition as a member of the 2010 All-Big Ten team, he was taken in the eighth round by the Rangers in 2010 . He joins his fifth organization, having previously been a member of the Texas, San Diego, Detroit, and Philadelphia organizations, reaching Triple-A Tucson in 2012. Roof was signed to a minor league deal by the Detroit Tigers before the 2013 season and was dealt to the Phillies before appearing in a regular season game. He split the year between Low A Lakewood and High A Clearwater, hitting .254/.321/.381 while playing both middle infield positions.